Point State Park, at the tip of Pittsburgh's "Golden Triangle," commemorates and preserves the historic heritage of the area during the French and Indian War (1754-1763). 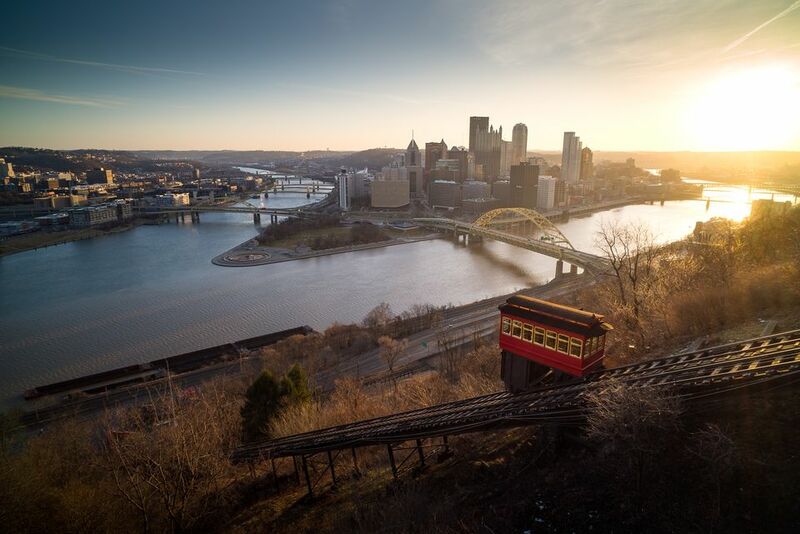 Along with the history, Point State Park provides a beautiful 36.4 acre getaway in downtown Pittsburgh with paved riverfront promenades, beautiful views, a 150-foot tall fountain and a large grassy area. Point State Park is located right at the tip of downtown Pittsburgh, at the "point" where the Allegheny and Monongahela rivers meet to form the Ohio River. It can be accessed by east or west by I-376 and I-279, from the north by PA 8 and the south by PA 51. A bike and in-line skate route connects Point State Park with the North Shore Trail, the South Side Trail, and the Eliza Furnace Trail straight through the city. Point State Park is free and open to the public, as is the Fort Pitt Museum located within the park. Point State Park is a National Historic Landmark and tells the story of Pittsburgh's pivotal involvement in the French and Indian War. Twenty-three monuments, plaques, and markers throughout the park commemorate the events, people and places of historic importance. If you're not into history, Point State Park also offers a beautiful place to spend an afternoon with a paved promenade circling the rivers, a huge fountain for cooling off and beautifully landscaped grounds made for strolling. The French-held Fort Duquesne gave them control of the Ohio Valley until a British army, led by General John Forbes, arrived in 1758. The outnumbered French burned the fort and departed. Soon Fort Pitt was under construction on the same site -- the most extensive fortification by the British in the American Colonies. Fort Pitt had five sides with a bastion (projecting part) on each side. Three bastions from the original fortification have been recreated: the Music Bastion, which has been partially excavated and recreated to reveal part of the original fort's foundation, the Flag Bastion, and the Monongahela Bastion. Housed in the Monongahela Bastion, the Fort Pitt Museum preserves the frontier history of Pittsburgh and Western Pennsylvania through numerous exhibits and displays. It's open to the public from 9 a.m. to 5 p.m. Tuesdays through Saturdays, on Sundays from noon to 5 p.m. and is closed on Mondays. An admission fee is charged for those 12 and older. The Fort Pitt Blockhouse in Point State Park, built in 1764 by Colonel Henry Bouquet, is the oldest authentic building in Western Pennsylvania and the only remaining structure of the former Fort Pitt. The 150-foot fountain at Point State Park was dedicated by the Commonwealth of Pennsylvania on August 30, 1974. Contrary to popular belief, water from the fountain does not come from Pittsburgh's three rivers, but from a 54-foot-deep well dug down into an underground glacial stream sometimes called Pittsburgh's "fourth river." Three 250 horsepower pumps operate the fountain at Point State Park, which contains over 800,000 gallons of water accented by lights. The circular basin of the fountain, popular with sunbathers, is 200 feet in diameter. The fountain operates daily from 7:30 a.m. to 10:00 p.m., weather permitting, during the spring, summer and fall seasons.